Another paper in Science Fair with a doom and gloom story about Global Warming melting Greenland ice and of course the usual "it is worse than we thought" mantra. "The changes on the Greenland ice sheet are happening fast, and we are definitely losing more ice mass than we had anticipated," says study co-author Isabella Velicogna of the University of California-Irvine. "We also are seeing this trend in Antarctica, a sign that warming temperatures really are having an effect on ice in Earth's cold regions." Air temperatures over the Greenland ice sheet have increased by about 4 degrees since 1991, which most scientists attribute to a buildup of greenhouse gases such as carbon dioxide in the Earth's atmosphere. 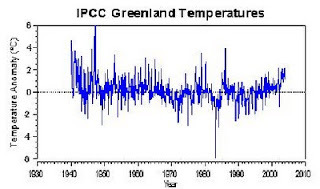 Now courtesy of World Climate Report I checked Greenland's Temperature record to see this extraordinary 4 degrees rise attributed to Global Warming. We can see that the current Greenland temperature has a long way to go to reach the levels measured between 1940 and 1960 (without SUV's) and is in no way unusual. The loss in Greenland ice in 1940 must have been much more than current melting but alarmist "scientists " would not be interested in that although it would be of vital concern to a real scientist interested in changes in Greenland ice .